"CityViewAR is a mobile Augmented Reality application that allows people to see how the city was before the earthquakes and building demolitions. Using an Android mobile phone people can walk around the city and see life–sized virtual models of what the buildings looked like on site before they were demolished, and see pictures and written information. Hundreds of 3D models of key city buildings have been made available from architect Jason Mill of ZNO, while the Christchurch City Council and Historic Places Trust have provided photographs and building histories. CityViewAR is based on the HIT Lab NZ Android AR platform which uses the GPS and compass sensors of mobile phones to enable virtual information to be overlaid on live video of the real world. Android AR makes it easy for Android developers to build their own outdoor AR applications. 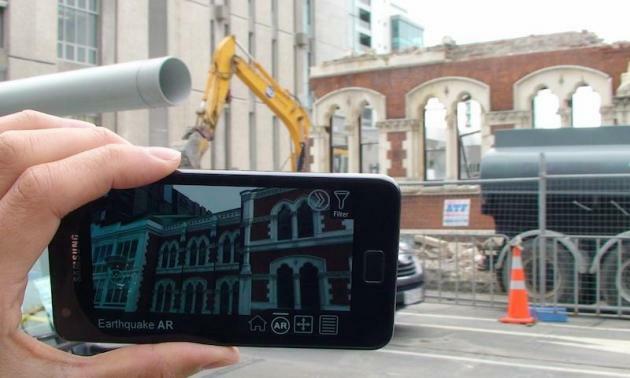 The software was previously used for showing individual buildings, but this is the first time that it has been used to show dozens of buildings at once, and the first time in world that mobile phone AR has been used for earthquake reconstruction." "Neat Places is an essential guide to the distinctive restaurants, cafés, bars, shops and galleries in New Zealand. Well, Christchurch, Wellington and Oamaru for starters. Our aim is to unveil the treasured places and celebrate the spirit of this eclectic mix of towns (with more to come!). Whether you're a local or just visiting, you'll find something here that tickles your fancy." 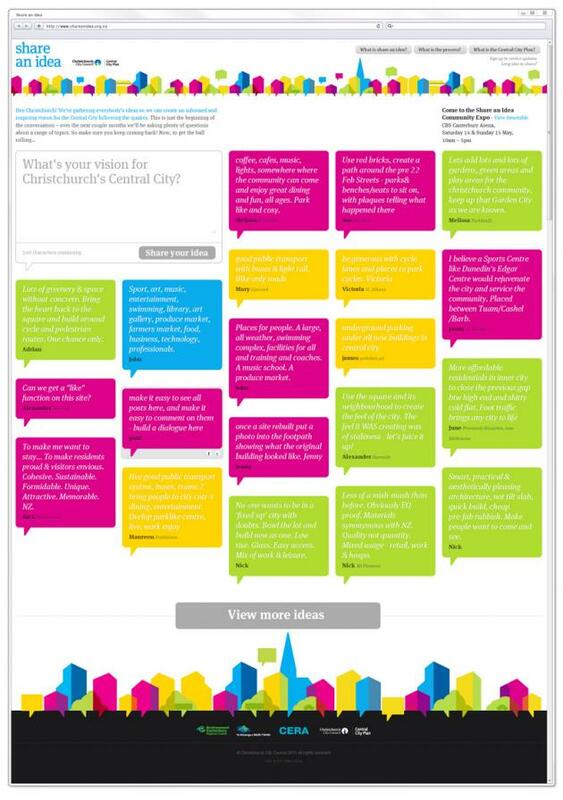 "The draft Central City Plan has been developed and written from the 106,000 ideas shared by our community during the six–week Share an Idea campaign. This includes all ideas shared through the website, the two–day Community Expo attended by 10,000 residents, the public workshop series 450 residents participated in, meetings with various key stakeholders and discussions with councillors, interest groups and professional institutes. The draft plan also takes into account the work Council had already done to revitalise the Central City and other relevant Council policy." "Fifteen urban designers, business leaders, arts and tourism representatives, geo–tech experts, architects, environmentalists, students and a Central City resident for 57 years will share their ideas for Christchurch's Central City in the Speakers' Corner at this weekend's (14 and 15 May) community expo." "A 14–minute video of earthquake damage in the CBD was screened at the memorial service on Friday 18 March 2011. Footage by Frank Film for the Ministry of Civil Defence."